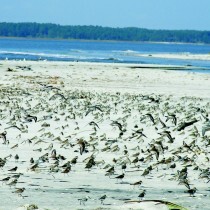 A variety of shorebirds and migratory songbirds nest on St Catherines Island. On St. Catherines Island, several shorebird species nest on beaches, bars, and shell rakes. St. Catherines and Little St. Simons Island produce the most successful fledglings for some species along the Georgia coast. 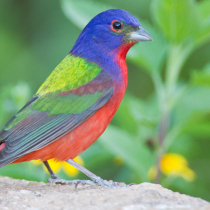 Painted buntings (Passerina ciris) are migratory passerine birds that nest on St. Catherines Island in the summer. The male species is one of the most colorful birds in North America— with a rich blue head, a yellow and green back, and deep red underparts. The species winters in southern Florida, Cuba, and Central America. 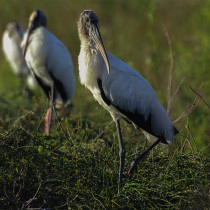 In the United States, wood storks (Mycteria americana) are distributed from northern Florida to southern North Carolina and west into Mississippi. The U.S. Fish and Wildlife Service lists the species as Endangered throughout its range and the Georgia Department of Natural Resources lists it as an Endangered species in the state.